RV Kitchen: What kind of oven is in your RV kitchen? 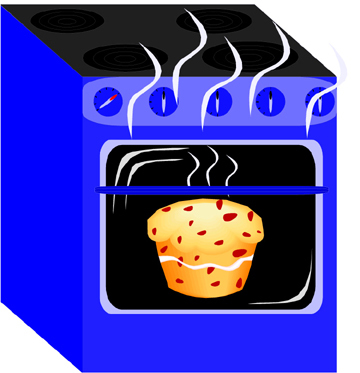 What kind of oven is in your RV kitchen? Looking in the RV kitchen – or galley – things most often look a lot like home. Sink with a single lever faucet, dual door refrigerator, but that oven – there's where the differences can come in. Lately, some RV manufacturers are hedging their bets that you don't need an oven, at least not a conventional oven. What's in your prospective RV galley? Conventional range top/ovens most often operate on propane gas. The stove top itself will usually have three burners, but two isn't uncommon, and four burners (a blessing if you're a big-time kitchen user) are becoming as scarce as hens' teeth. Experienced RV cooks will tell you that RV gas ovens aren't as "good" as those at home: It seems as if temperatures in these little ovens aren't as even as some. Here's a tip around that problem: Upscale cookie sheets that are basically double-decker pans with a layer of air in between can produce far more even results. One line of them is called Air Bake. Slide your dish on one of these cookie sheets and the problem of uneven cooking may vanish. Why would you want a gas oven with the inherent "uneven temperature" problem? There's something to be said about cooking your meal in an RV oven on a cool night. The additional heat from the oven, coupled with the delicious odors that emanate forth from them just take off the chill. In some cases you'll find a conventional gas "cook top" or burners, but no gas oven. Here's a bit of a trade-off. You may like the extra space you'll gain, and generally you'll find a set of drawers under the cook top. More room for kitchen stuff. To make up for the "missing" gas oven, you may find a combination convection-microwave oven up above the countertop. Yes, these gadgets do really cook faster than a conventional oven, but they aren't without their drawbacks. So what's not to like about a micro-convection oven? Our own cook's experiences tell us that convection ovens, as nice as they are for baking up a meal in about a third less time than a conventional oven, don't do well when baking bread. If you don't bake bread on the road, not a problem. However, for those that spend time away from utility hookups and like your boondocking beware: Those microwaves don't come out of nowhere without shore power. That means to oven cook you'll have to fire up the generator, and plenty of boondocking RVers have said they hate firing up the genny just to get a meal. What are your options? If you're buying a rig new from the dealer and the standard floor plan shows no gas fired oven, you may be able to order the rig with an additional gas fired stove by leaving out those extra drawers. Other RVers have purchased an RV oven and plumbed it in on a slide-out tray in the basement storage area of their rig. In camp, they slide out the stove and pop in the meal. That could be just what the doc ordered on a hot day when you still want an oven cooked meal – and a cool RV interior. been fulltiming for 11 years with our microwave convection oven, love it. We boon dock in Mexico for 5 months of the year and use the oven a lot. Yes we have to use the genset, but where we are there is no one to complain.